I’m an artist, writer, and full-time mommy of three. I help readers who are sick and tired of all the “bad news” in the news refocus, and rediscover our beautiful world. Together we can smile, we can laugh, and we can light little candles of joy in our lives, because life is too short (and too wonderful!) to live in the shadows. In case we haven’t met yet (here’s me in a nutshell). First off, honesty and transparency is terribly important to me. Bujard is my maiden name, and not typically the one I go by. I married into the name Schlichting you see. It’s pronounced sh-lick-ting, and not all that hard once you practice it a few times, but it’s hard not to do the mental gymnastics when you first see it. So I’ll try and avoid the fate of authors with long, unpronounceable names. I’ve been drawing and making up stories for as long as I can remember. One of my first was a three-page picture book with an audio recording to go with it. My memory is a bit foggy, but I’m 75% sure it was about an alligator. Animals were all the rage at the time, and 5-year-old-me was most interested in a few…less conventional ones- like alligators, sharks, and dinosaurs (horses and dogs had a place too of course, just a little lower on the list!). My interest in dinosaurs and all things prehistoric really kicked off when I saw Jurassic Park for the first time. 6-year-old me stared at that screen like dinosaurs had come to life. That scene when Dr. Grant looks up and sees the brachiosaurus towering above them…I was in awe. From that moment on I was dead set to be a paleontologist. Well, up until I was 13. Then I started thinking more “grown up” thoughts, like how I’d get an income, and those long, tedious hours in a museum basement…so I kept dinosaurs on a back burner while I focused on important life stuff- like college and jobs and discovering my dear Hubby. Which leads me to my inspiration. I would readily describe myself as blissfully married (seriously, and on a regular basis), and I stay at home with our three young children (all under 5) who keep me on my toes and provide endless entertainment. The sheer delight when our little girl squeals, “Dere it is! Lady-buh!” Or the hours of focused attention our 4-year-old Bugabug devotes to all things mechanical…30 minutes later…still making his ride-on tractor spin out so he can watch wheels turn. Add to this a healthy mixture of chickens, horses, deer…the occasional giant centipede or visiting peacock…what more inspiration could a writer need? I’m no expert, but I love learning more about our beautiful world. I would be delighted if you’d like to join me. I’m what some would call an “armchair enthusiast” when it comes to dinosaurs. I’m not a paleontologist, but I read the scientific papers available to the public (so a bit beyond Jurassic Park). I also love observing life, and practicing my craft as a creative mom. Here’s what you can expect to see on the site. This is a basic list, but what do you want to know more about? 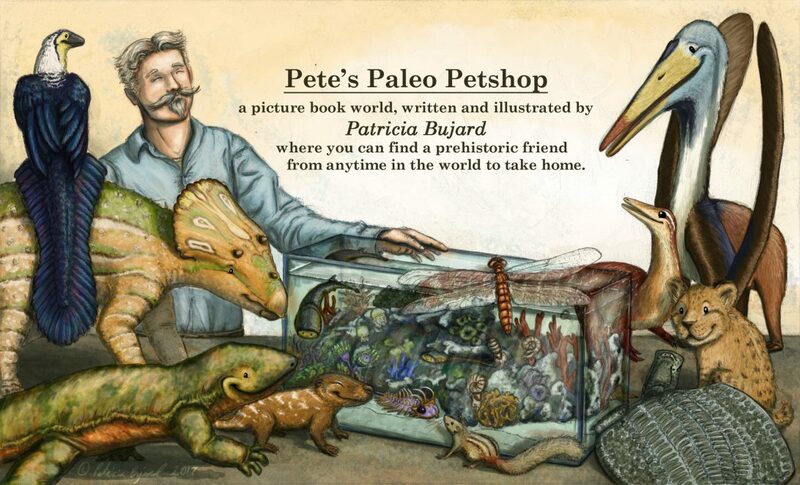 Anything about Pete’s shop, art, and prehistoric critters is fair game! I found the site! Now I need to watch Jurassic Park to know who Dr. Grant is (which is a sad thing, I am sure)!